Rachael R. Resch, MS PT/LMT, is a certified Nia Black Belt instructor, Nia Trainer and holistic physical therapist. She is owner of Synergy Physical Therapy in Ashland, and teaches Nia movement classes and seven-day Nia somatic retreats at The DanceSpace. Her practice is devotion to the sacred body for healing, fitness, play and prayer. Rachael holds degrees in science, religion and dance, and since 1978 has studied with leading teachers in mythopoetics, somatics, energetics and the arts. How did you get into Nia, Rachael? I actually did not believe her, but my longing to move was greater than my self-doubt. I became a regular student. I learned how to do all the movements in a micro way. Because Nia is based on listening to your body and moving your body’s way, I was able to adapt it for my own situation. Miraculously and unexpectedly, I learned how to move without exacerbating the asthma. This gradually helped heal my lungs so that over the course of a few years I went from being on high levels of medications to having much better function and being able to return to work. I did not know it at the time, but I had become what in Nia we call a sensation scientist – doing sensory research in the sacred laboratory of my body. As a result, I developed what we call body literacy – the ability to listen to, understand and respond appropriately to the voices of my body as communicated through sensation. The Nia Technique® is a sensory-based movement practice that leads to health, wellness and fitness. The foundational principle of Nia is the joy of movement, which we define as the sensation of the life-force energy moving through your body. 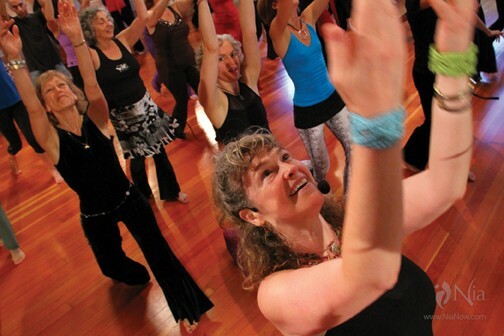 Nia blends nine movement forms –three martial arts: Tai Chi, Aikido, Tae Kwon Do; three dance arts: Jazz dance, Modern dance, and Duncan dance, based on the work of Isadora Duncan; and three healing arts: Yoga, Alexander Technique, and the work of Moshe Feldenkrais. Nia was created in 1982 by Debbie Rosas and Carlos AyaRosas, out of their desire to move and self-heal body and mind through pleasure. Today Nia is taught in 49 countries around the world. You have a Nia White Belt trainings coming up in Portland and in Ashland in March, and in Helena, Montana in June. What happens during a White Belt intensive? The Nia White Belt intensive is a seven-day somatic retreat for body and soul. Nia models its education system after the martial arts belt system. The White Belt training focuses on the physical body. The Green Belt training focuses on teaching Nia, for those who desire to teach. The Blue Belt training focuses on communication, relationship and intimacy. The Brown Belt training focuses on energetics. And the Black Belt training focuses on the unknown. The Nia White Belt training is based on the 13 Nia White Belt principles that provide the foundation for the comprehensive somatic education that Nia offers. During the intensive, we explore each of the 13 White Belt principles cognitively and experientially. We begin with White Belt Principle #1 – The Joy of Movement, and White Belt principle #2 – Natural Time, moving in your body’s own natural timing as opposed to having to stay in lock step with the music. Why would somebody want to take the White Belt? People take the Nia White Belt intensive for a variety of reasons, and it’s very personal to each individual. The White Belt is the first step of training for people who want to become a Nia teacher and offer Nia professionally. However, what we are finding is that at least half the people who come to the Nia White Belt intensives are not interested in teaching per sé, but are looking for a deep somatic, transformational experience, a way to increase their own intimacy with their bodies, and increase their consciousness through their bodies. People participate not only to improve their fitness physically, but also mentally, emotionally and spiritually. Some people in the intensive may have never taken Nia before, some are dedicated Nia students, while others are new to Nia but have heard of Nia’s reputation. One of the lovely things that happens over the course of the seven days of a Nia White Belt intensive is that community is created. The White Belt is the alchemical vessel or container of community, creating a unique kind of magic. Each person’s body is unique, each person’s life experience is unique In the Nia practice and the Nia White Belt training we honor that uniqueness. I’m really excited to see what unique spirits are going to show up for this next training and where we go as a result of who is there. Do people need to be experienced dancers or in good physical condition? Absolutely not! When I took my Nia White Belt, I was only somewhat healthier than when I walked into my first Nia class. I actually had to sit out a lot of the time. Because of the healing arts component and because Nia is based on sensory awareness, each person is encouraged to participate according to his or her own body’s way. All ages, sizes, abilities, and levels of experience are welcome. The diversity of participants is part of what gives Nia its richness. If you have a body and you want to explore life in your body in a loving and compassionate way, then the Nia White Belt training is for you. Any final thoughts about Nia or the White Belt training? As a former professional dancer and a physical therapist for over twenty years, I have been really impressed with the depth and breadth that the work of Nia offers. I find the blending of the nine movement forms, the consciousness of the body, and the deep body-based spirituality that Nia brings make it rich and profound. Nia is continually offering something new and beautiful to nourish our bodies, and to nourish our minds, hearts and spirits. Nia empowers us, in the animal nature of our bodies, in the organic life forms of our bodies, to feel the life-force energy and the energy of the Earth giving us grounded vitality, strength and flexibility during these exciting and troubling times. Paddy Brannans Irish Pub Bikram Yoga-Some Like it Hot!